Founders House Publishing LLC, 9781945810008, 290pp. 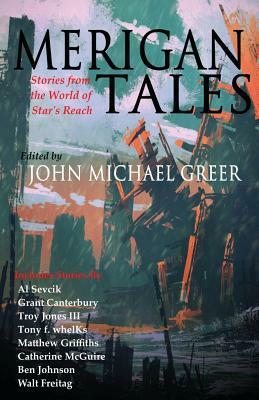 In Merigan Tales: Stories from the World of Star's Reach, author John Michael Greer brings together eight authors in a shared-world anthology of brand new tales inspired by his popular novel, Star's Reach. These are stories of the far future in a world where fossil fuel-powered industrial civilization is a distant memory and new societies have emerged.